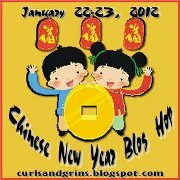 There is a tremendous amount of excitement in the home of our Chinese New Year Blog Hop hostess, April Nourse. Her family has expanded by one -- a son -- who came to California just two weeks ago from Taiwan. 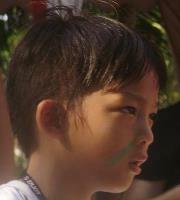 Alex, the very handsome young guy, is six years old! 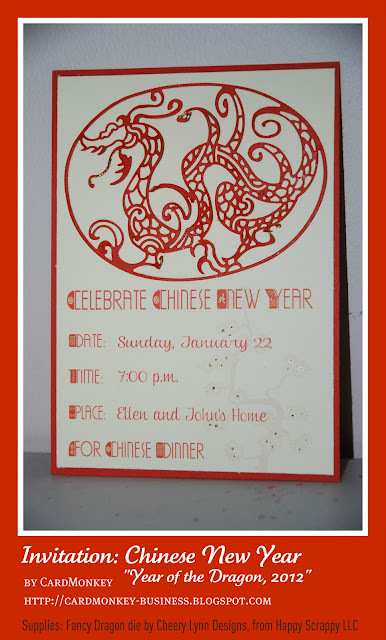 To welcome Alex and to share her happiness with us all, April invited her bloggy friends to celebrate The Year of the Dragon, Chinese New Year. You should have arrived here from the Queen T's blog spot; if not, or if you're one of my followers who'd like to start at the beginning, please go to April's site and wish her well on her journey (and learning Chinese!) with her wonderful gift from Taiwan. Isn't that just the perfect die to use for this occasion? It's by Cheery Lynn, and I bought it from my favorite vendor -- Happy Scrappy LLC -- who sells these dies at a deep discount. Alex, the owner, is a generous sponsor of many of the hops I am in, and I hope you will patronize him when you're shopping for dies. Please tell him I sent you! SPECIAL BLOG CANDY alert!! For my SUPER blog candy for this Hop, I am giving away the die I used to make this invitation! It is beautiful ... and in addition to the dragon (shown above), there is an oval lattice frame that circles it that can be used on many other projects. I will tell you that I had difficulty using this die at first. Then I contacted Alex at Happy Scrappy who was the best in terms of walking me through the use, leading me to some excellent videos -- and urging me to buy a "Cuttlehug" metal plate adapter to use with these very thin, intricate designs. Alex sells these adapter plates in two sizes, and also sells other supplies (like B and C plates for Sizzix and Cuttlebug, embossing pads, and crafting picks) -- no craft room should be without them as mine was!! c) "My favorite Chinese food dish is ...."
Winner will be picked at random using Random.org, and announced on this blog on Tuesday, January 24 (since this is a 2-day hop). I hope to have another project for you tomorrow (January 23), so you can leave another comment then for 2 chances to win. Post about this hop on your blog or on Facebook, and get another chance to win!! So now head on over to the next stop on the Chinese New Year Hop: PSA Essentials! Ellen - http://cardmonkey-business.blogspot.com/ <--- YOU ARE HERE! Beautiful invite and hope your dinner is fantastic! Wow...love that invitation. Mine must've gotten list in the mail...lol. hope you party is awesome. My favorite Chinese food is chicken lo mein. Hugs! This is a great invitation. Clean and simple and perfect. My favorite dish is Lo Mein. Love being in blog hops with you. This is so pretty! I love how intricate the design is. My favorite Chinese dish is Sesame Chicken! What a great invitation. Love the red and whit color scheme. The dragon is marvelous. Already a follower of yours and I love Shrimp Mai Fun. Your invitations really suits the celebration!!! Love the dragon!!! Oh I forgot , I am a new follower! Kung Hee Fat Choy! Hope you have fun at your dinner. My favorite Chinese food is Jai. I also like a lot of the "Americanized Chinese" food like General Tso's Chicken, Sweet Sour Spare Ribs, and Black Bean Crab. Nom nom! Ellen, your dinner invite is beautiful. That is an amazing die! Have fun celebrating the Chinese New Year at your dinner. your invitation is very nice and my favorite Chinese food dish is Barbecue pork and sweet and sour chicken. I am already a follower. Beautiful Invit. love love the Dragon its the Best love Dragons. great colors and papers. thanks for sharing. I can't believe all the amazing projects on this hop and your card is just spectacular! That die is gorgeous and I would love to have a chance to win it! My favorite chinese food dish is asparagus beef. Great card! And yp I love BBQ pork buns!